An Origami Diaper Cake - You'll be the only one at the party with one of these!! I gotta admit, I never in my life would have dreamed up an Origami Diaper Cake. But here it is, in living color! This creative and delightfully original diaper cake is so cute! Talk about working well under pressure! 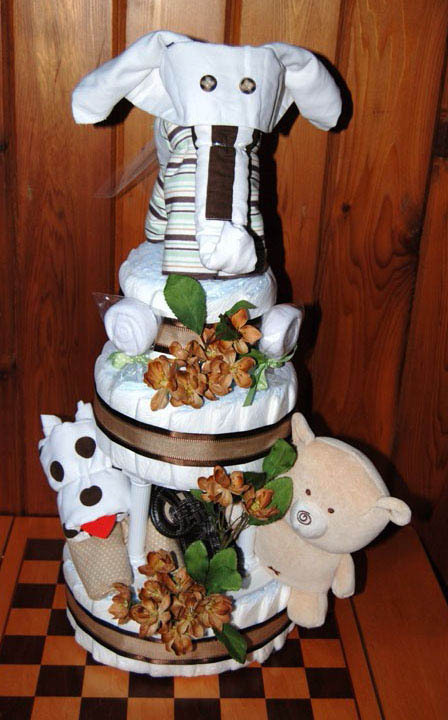 This diaper cake design was created, designed, made and submitted to us by Lynn from Florida. What a stroke of creativity she had! And I am SO glad she was caring enough to share her diaper cake ideas with the rest of us. She has inspired all of us with a flair for something new. Thank you Lynn!! This design was created out of desperation. It is a gift for a friends daughter and her registry just did not inspire me so I used her color theme and inspired myself. The Origami elephant and the origami puppy are each made with two receiving blankets and one burp cloth. I like to use columns with some of my cakes as it gives them added height and also creates a space for extra filling. I find the columns and cake circles in the cake decorating isle at Michaels or Walmart. Lynn, thank you for sharing your amazing creativity!! Want to make your own diaper cake, but don't know where to start - Take Step #1, #2 and #3 and you'll have a diaper cake in just an hour or two!